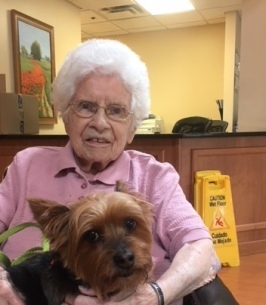 Jacqueline ‘Jackie’ Finkle, 89, of Suffield, formerly of Enfield and Portland, passed away peacefully on October 3, 2018. Born in Middletown, on July 21, 1929; daughter of the late Horace and Genevieve (Healy) Finkle was raised in Portland, and graduated from Portland High School. Jackie was employed by Valley Oil in Portland for 27 years and retired from Greater Hartford Easter Seals, Hartford and Windsor offices after 27 years of service. Jackie was an active communicant of Sacred Heart Parish, Suffield. She is survived by a sister Patricia Flanagan and her husband Joseph ‘Peter’ of PA; and a brother-in-law William Burgess of NH; four nieces, Nora, Karen, Sharron, Maureen; one nephew John; and very dear friends Elizabeth and Stephen Sorrow of Suffield; and a favorite doggie visitor 'Sammy'. Funeral Services will be on Tuesday, October 9, at 9:30AM from The Heritage Funeral Home, 1240 Mountain Road, West Suffield, with a Mass of Christian Burial at 11:00AM in Sacred Heart Church, Suffield. Burial will follow in Trinity Cemetery, 345 Main St, Portland, CT 06480. Friends may call at the funeral home from 9:30-10:30AM on Tuesday prior to the funeral services. 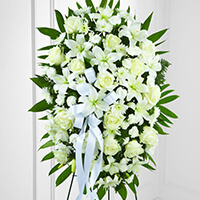 To send flowers to the family of Jacqueline "Jackie" Finkle, please visit our Heartfelt Sympathies Store. Funeral Services will be on Tuesday, October 9, at 9:30AM from The Heritage Funeral Home, 1240 Mountain Road, West Suffield, with a Mass of Christian Burial at 11:00AM in Sacred Heart Church, Suffield. Burial will follow in Trinity Cemetery, Portland. Friends may call at the funeral home from 9:30-10:30AM on Tuesday prior to the funeral services.